As the siege horror continues, Shona is being held at knifepoint by her son Clayton, who broke free from his prison guard last week after being allowed to attend his dad’s funeral! Armed police are surrounding the derelict building where Clayton is holed up, and David, Shona’s partner, is watching on, petrified Shona is going to die in front of his very eyes just like his wife Kylie, who was murdered by savage youth Clayton. ‘So far, Shona has begged her son to hand himself in, but when Clayton tried to escape he found the place was surrounded by police,’ explains Julia Goulding, who plays the mum. 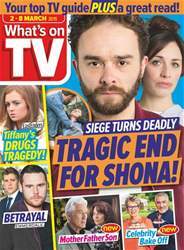 ‘Clayton feels that he has no choice but to hold Shona hostage. Then he threatened to kill her if the police didn’t meet his demands.’ So, will it be a tragic end for Shona? Will Clayton kill his mum?